Report from cnnaija revealed that yesterday, hijab crisis at the University of Ibadan International School took a new twist as Christian, traditional religion and some Muslim pupils' parents stormed the office of the institution, Prof. Adeyinka Aderinto, to register their displeasure against the Muslim Parents Forum. The forum had been championing the wearing of hijab by female Muslim pupils. Members of the Muslim Parents Forum had twice in the last 10 days distributed hijab to their female pupils against the school's prescribed dress code. The Muslim parents had written a letter to the school management and governing board stating that their female pupils must be allowed to wear hijab on their school uniforms. The letter was entitled: ''Notification of Muslim Parents' Resolution on Hijab for our Muslim Girls in ISI'. Their agitation and the attendant threat to peace led to the indefinite shutdown of the school on Monday. Series of meetings, including that of the Parent-TeParen Association, which the Muslim parents attended but left midway following itreconcilable difference s with the school management and other stakeholders, could not douse the tension in the ISI. 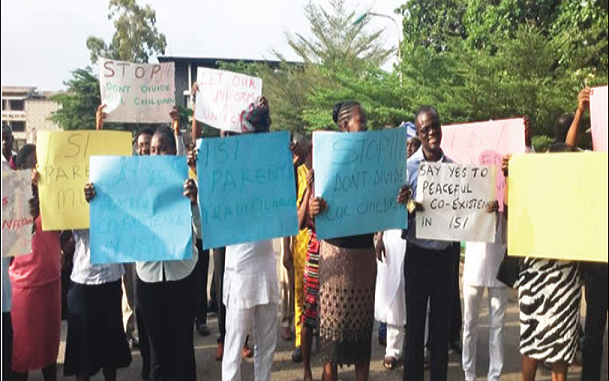 On Wednesday, many placard-carrying parents, including an Ifa priest and researcher, who is also the father of two pupils in the school, Awosanmi Abe, condemned the approach of the Muslim parents to the issue of hijab. The protesting parents said wearing of hijab in the 55-year-old school was capable of dividing the students along religious lines. Aside Abe, other leaders of the protestors were Olalekan Thank, a lawyer, and Olusola Aleshin. They argued that the school was an indivisible entity, which no one or group should be allowed to divide for any reason. The protesters described as dangerous a situation where little children were being made to discriminate against each other along religious, ethnic and other sentiments instead of emerging as global citizens. 'Clamour for the introduction of religious emblem for our children in the International School, University of Ibadan', the parents urged the school's board, which is headed by the DVC, to ensure that the rules and regulations guiding the institution, and to which all parents signed to upload, reigned supreme." They insisted that the pupils were friends and colleagues as well as their parents, stressing that any attempt by some Muslim parents to divide them should not be allowed to succeed.